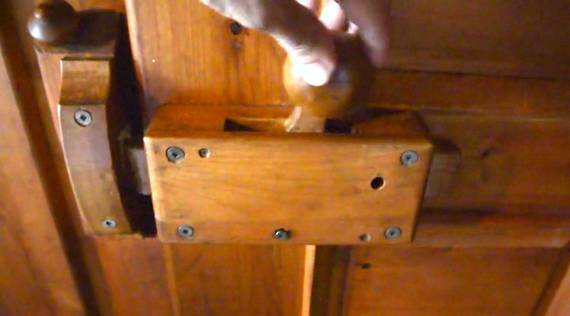 My dad originally started making wooden door latches for the cottages he built at Amogla camp. 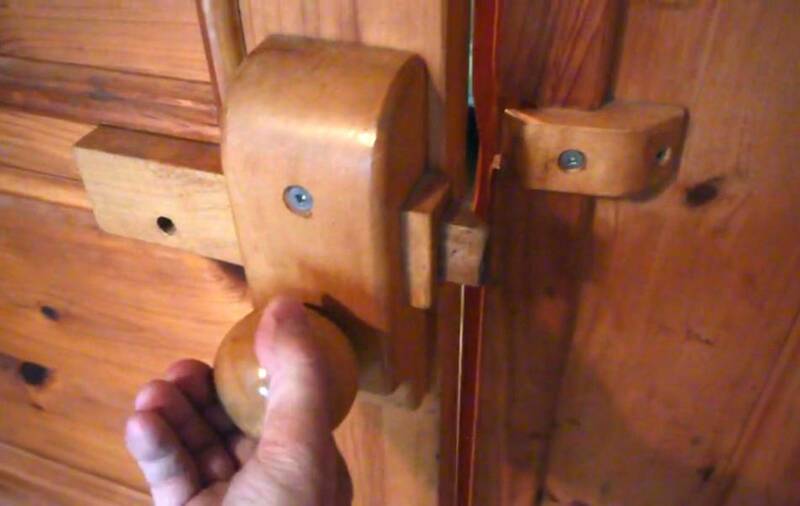 Conventionally available doorknobs and strike plates don't allow for a lot of latitude in terms of dealing with shifts in the buildings from frost heaving. That, and the available door hardware just didn't suit his style. At left, one of the first door latches that my dad built for the first new cottages he built in 1982. 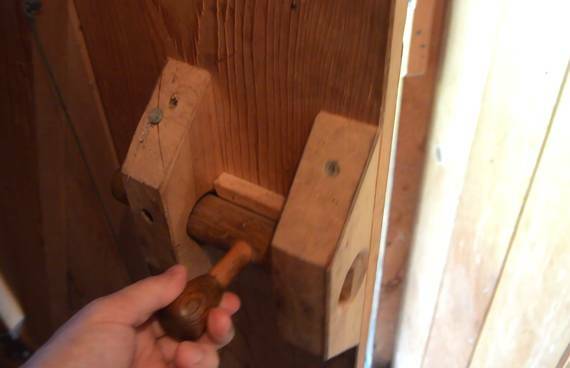 At right, a simple slider latch for the wood shed part of the same cottage. For another cottage, built in 1983, he actually tried to replicate something more like a door knob. Turning the knob counterclockwise causes a pin in the shaft that the knob is on to pull the wooden bolt back. 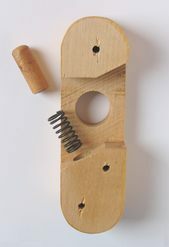 The bolt is spring loaded, so the door can actually close on its own, though friction is a bit too much for that to work well. 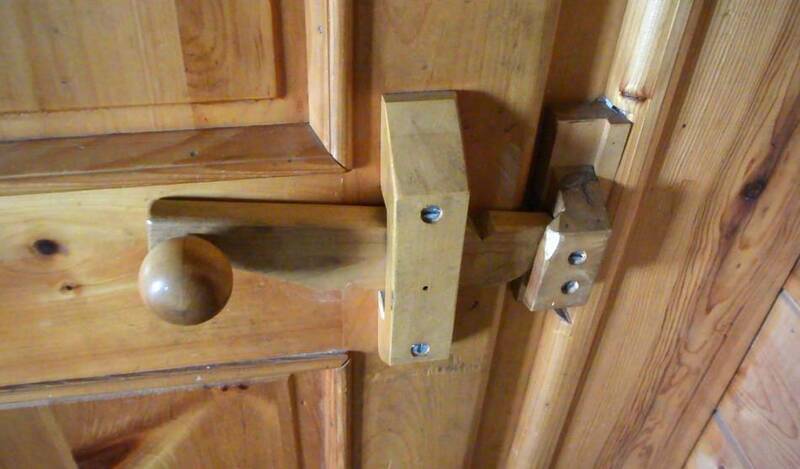 At right, my favourite door lock at the camp, part of cottage #2. 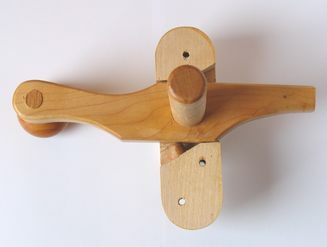 This one uses a lever to activate a slider. Very satisfying to open and close. At left, the main door latch for a cottage, from 1984. This one latches shut very smoothly when the door is pushed shut. To fully appreciate it, you have to watch the video. At right, an internal door latch in the same cottage. This one is a slider. 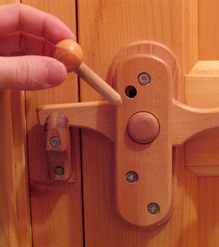 a wooden pin can be inserted into a hole to lock the bathroom door. 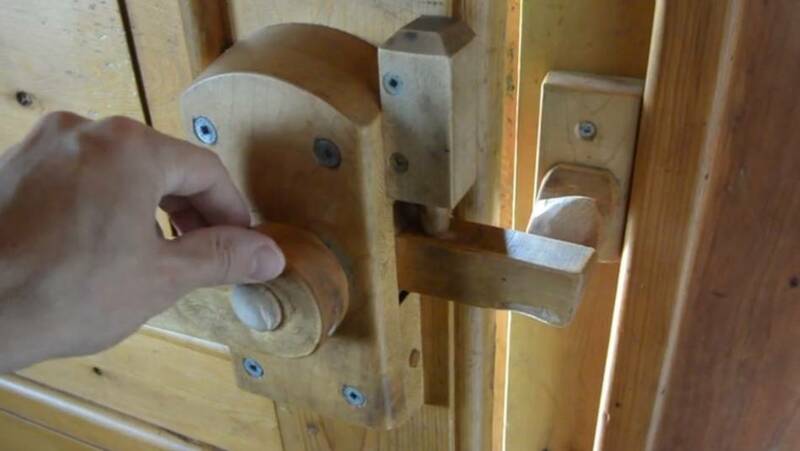 In fact, all the "locking" is done by inserting pins into the locks. To lock the cottage from the outside, a conventional padlock is used. Inconvenient, but the cottages really only get locked over the winter. 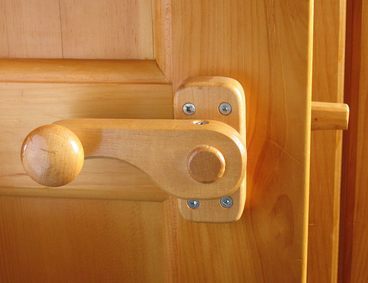 The door latches pictured below are for the house my dad built in 1994-1995, more than 10 years after making his first door knobs and latches. 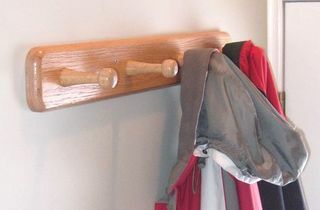 They are an evolved version of his original door handles. 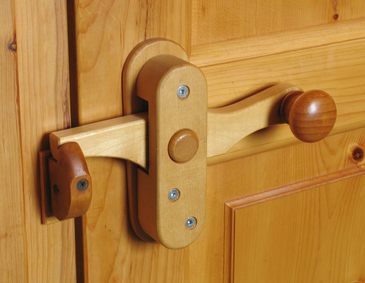 These ones incorporate an internal spring, allowing them to latch closed on their own when a door is pushed shut. 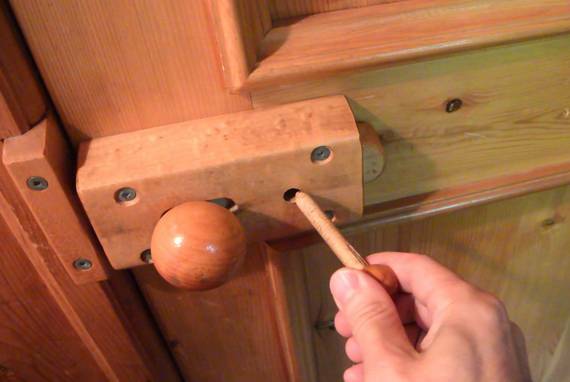 For bathroom doors, there's an additional pin that can be pushed through the body of the block, which prevents the handle from turning. 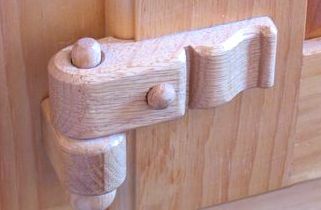 Also interesting are some of the sliding latches he made. The one pictured above is for a small door leading into the attic. 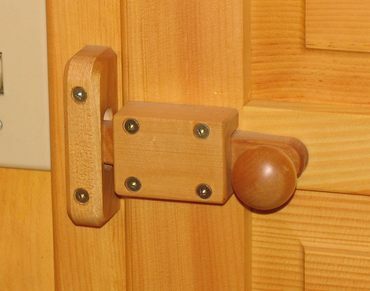 The latch can't be opened from the other side, so its a little simpler. 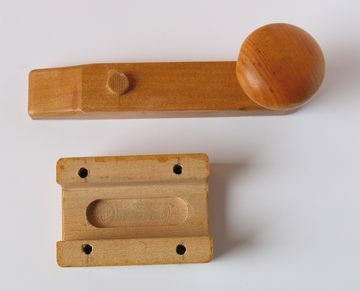 To keep the slider from getting pulled all the way out of the block, it has a small dowel in it, which slides in a slot in the block - as pictured above. I hope these inspire you to create your own. I don't make these for sale.